Here’s the audio from my appearance with Leigh Esau and Joan Kinsey on the Jack & John Show this morning. It was a blast, as always. Thank you, Jack and John, for having us on the show. And thank you Leigh and Joan for joining me on relatively short notice. I like to think that we made at least a little bit of difference. The Missus was approached this morning at the Y by a woman who said she had heard the show. She had pondered forster parenting for a while, but she hadn’t quite been able to pull the trigger on getting licensed. After listening to us on the radio, she decided to give it a try. Thank you, anonymous woman, for taking that next step. Remember folks, if any of you are thinking about getting into foster parenting or if you want to support foster children in some way but you aren’t quite sure how, I’m here to help. If you haven’t played before, here are some examples to review: Snow Day Edition; Winter Solstice Edition; Mr. Wilson’s Vacation Edition, Nikkidemas Asked For It Edition.. Check inside for a list of the questions asked so far. Solved! Check inside to see how the answer was reached. 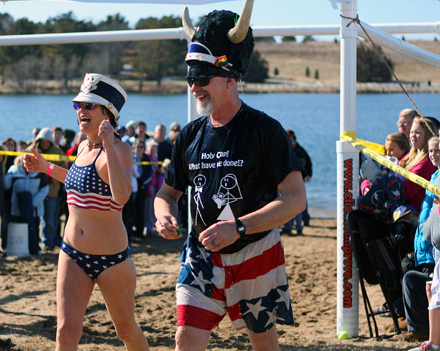 A bizarre assortment of freaks turned out for the Polar Plunge in Lincoln yesterday morning. This included the fruit of the loom guys, gnomes, bikini babes, cross dressers, superheroes, Austrian musicians, pirates, and various other weirdos. It was all to benefit the Special Olympics Nebraska. Good going all! Lincoln’s favorite roadway design has won an engineering award. That’s right, you haters out there. 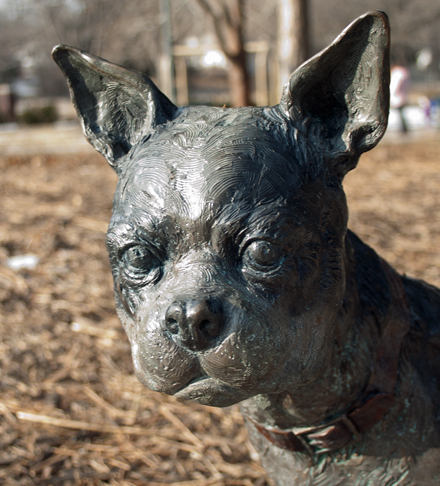 At least somebody loves the roundabouts outside Memorial Stadium. Actually, the only thing I don’t like about driving in that area is that when you leave the parking lot just north of Memorial Stadium, you can’t turn left (southwest) onto Salt Creek Roadway, and you can’t (legally) do a u-turn at 14th Street. That means I usually have to do a loop through Downtown rather than just going straight over to 9th Street as I’d prefer. Bleh. You’ll be shocked to hear that Whole Foods is the grocer being discussed to go in to the new LPS project at 59th and O Streets. That was one of the worst-kept secrets in recent memory in Lincoln. The only remaining question, I suppose, is will it actually happen? Momentum seems to suggest that yes, it will. But we’ll see. If nothing else we now have solid evidence that Whole Foods is shopping in the Lincoln market, and we have a rough idea of the sort of location they’re looking at. Even if this particular project doesn’t work out—and I’m not aware of any good reason to think it won’t—we can be fairly certain Whole Foods is going to show up somewhere eventually. That’ll make many locals giddy. I don’t know all the facts of the case. I wasn’t on the jury. I didn’t investigate the case. I wasn’t there at the time of the crime. But after the conviction of Armon Dixon based largely on his selection out of a photo line-up, this MSNBC piece seems relevant. Ivanna Cone is hosting a fundraiser for the William G. Lauer Foundation on February 28 from 6pm to 9pm. The foundation supports individuals living with ALS in Nebraska. For a $10 donation, attendees get to sample 30 flavors of ice cream. Last year’s event raised over $2,000. Ivanna Cone offers the best ice cream in Lincoln, but the toughest part of going there is deciding which flavor of ice cream to order. At the fundraiser you won’t have to decide—try ‘em all! That’s my kind of fundraiser. The Wilsons are headed northwest this summer. I would love to hear any advice any of you folks have to help improve our trip. First we’re going to spend three nights at a cabin at Fort Robinson. We’ll be there with my parents and my sister’s family. We last went in 2009 when Robbie was three. Our family has grown 40% since then, so it will be exciting to get back out there with the larger crew. After that we plan to head up to the Black Hills. We’ll probably hit Cascade Falls on our way up toward Hot Springs. After that ... who knows! There’s so much to do: Custer State Park; Needles Highway; Jewel Cave; Sylvan Lake; Harney Peak; the mammoth dig; Mt. Rushmore; Reptile Gardens; and on and on. We’ll probably rent a cabin and stay for anywhere from 3-7 days; four days is probably most likely at this point. I’ve been to the Black Hills many times, but my most recent visit was way back in July 1995*. I imagine things have changed a fair bit since then. What’s hot these days that we just have to see? What should we definitely avoid? Any “hidden gems” we ought to investigate? Any cabin recommendations? The vacation is five months away but I’m already looking forward to it. Who doesn’t love a road trip? Joey and Keishor have never been on a vacation like this so it will be fun to see their reaction to everything. I imagine we’ll hear many shouts of “This is so cool!”. And probably lots of “Are we there yet?“s as well. I guess that’s unavoidable. * The last time I was in the Black Hills was in 1995 with my parents. It was our last major family vacation, though my sister didn’t go with us. I read a lot of books on that trip, one of which was Congo by Michael Crichton. I really enjoyed it. On a particularly scorching hot day we decided to enjoy the air conditioning in a theater. We decided to see Congo since I had just read the book. SPOILER ALERT: the movie sucked donkey socks. Whodathunk that one of the most memorable parts of that trip would be going to watch one of the most wretched atrocities in cinema history? Amy! Amy! Ugh. Stupid animatronic gorilla.